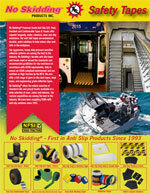 A coarse, textured anti slip tape that provides slip resistance in both wet and dry conditions. NS4400 provides conformability on irregular surfaces and is constructed from a non-mineral, coarse-textured, slip-resistant vinyl surface that has our water-resistant, acrylic adhesive that is ideal for wet conditions and barefoot friendly as well as suitable for shoe traffic. Applications: Showers, bathtubs, stairs treads, boats, locker rooms, therapy rooms, and equipment entryways, swimming pools, around hot tubs, surfboards, step stools, aquatic equipment, and many more applications. Used in hospitals, hotels, motels, and residences for years. Our vinyl tape is completely sanitary. Vinyl construction can limit the growth of odor causing germs and bacteria. Will not fade or wash out. 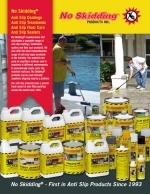 Simple application - as simple as peeling off the release liner and pressing firmly onto a clean, dry surface. When ready to replace your vinyl tape, just lift one corner and remove. Releases cleanly with no remaining residue to be concerned about. NS4400 provides conformability on irregular surfaces and is constructed from a non-mineral, coarse-textured, slip-resistant vinyl surface that has our water-resistant, acrylic adhesive that is ideal for wet conditions. Available Black and White. Anti Slip Vinyl Safety Tape is a coarse, textured anti slip tape that provides slip resistance in both wet and dry conditions. Anti Slip Vinyl Safety Tape is a coarse, textured anti slip tape that provides slip resistance in both wet and dry conditions. It has been used in hospitals, hotels, motels, and residences for years.